The Yosemite Firefall was a summer time event that began in 1872 and continued for almost a century, in which burning hot embers were spilled from the top of Glacier Point in Yosemite National Park to the valley 3,000 feet below. From a distance it appeared as a glowing waterfall. 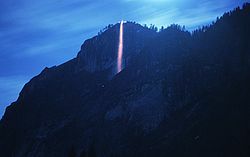 The owners of the Glacier Point Hotel conducted the firefall. History has it that David Curry, founder of Camp Curry, would stand at the base of the fall, and yell "Let the fire fall," each night as a signal to start pushing the embers over. The Firefall ended in January 1968, when the National Park Service ordered it to stop because the overwhelming number of visitors that it attracted trampled the meadows, and because it was not a natural event. NPS wanted to preserve the Valley, returning it to its natural state. The Glacier Point Hotel was destroyed by fire 18 months later and was not rebuilt. The Firefalls were performed at 9 p.m. seven nights a week as the final act of a performance at Camp Curry. In 1871, before Yosemite became a National Park, an Irish immigrant named James McCauley hired John Conway to build the Four Mile Trail from Yosemite Valley, where McCauley lived, to Glacier Point. When the trail was completed, McCauley built a small hotel called the Glacier Point Mountain House. McCauley and his wife Barbara operated the hotel during the summer months. In 1883, James McCauley sent for his niece, Elizabeth McCauley, to come from Ireland and help with the hotel. In 1897, before Yosemite was a National Park, the Washburn brothers, who owned the Wawona Hotel, had the Guardian of the State Grant evict James McCauley and took over his hotel at Glacier Point. They stopped the Firefalls. The following year, McCauley bought John Lembert's homestead in Tuolumne Meadows and ran cattle there. He and his sons built a small cabin on the property at Tuolumne Meadows; today the "McCauley Cabin" houses park personnel. The McCauley family sold it to the Sierra Club in 1912, and the Sierra Club sold it to the National Park Service in 1973. A 1921 advertisement for Camp Curry featured the Firefall and the voice of the Stentor. In 1899 David Curry established Camp Curry in Yosemite Valley. Soon he heard visitors reminiscing about the Firefall when McCauley ran the hotel at Glacier Point. Sometime in the early 1900s, Curry reestablished the Firefall during the summer season, when guests were at Camp Curry. He sent his employees to build a fire on the point and push it off on special occasions. David Curry: Hello, Glacier Point. David Curry: Let 'er go, Gallagher. On May 31, 1913, Curry and Assistant Secretary of the Interior Adolph C. Miller had a confrontation over the Curry Camping Company's lease. Miller told him, "I'm going to take the Firefall away. There will be no Firefall." Curry felt that a rival company, the Desmond Park Service Company, had influenced the Park Service against him. From then on, he began the nightly entertainment program by saying "Welcome to Camp Curry, where the Stentor calls and fire used to fall." In 1916, Desmond built the Glacier Point Hotel, a large chalet-style hotel with a commanding view of Yosemite Valley, Vernal Fall, and Nevada Fall. On March 8, 1917, Secretary of the Interior Franklin K. Lane granted the Curry Camping Company a five-year lease and said that the Firefall could be reinstated as a nightly summertime event. David Curry died on April 30, but his widow and son opened Camp Curry as usual that summer and presided at the reintroduction of the Firefall. Foster Curry shouted "Let 'er go, Gallagher" and continued as the caller for many years. The job of making the calls later was one that loud-voiced employees competed for. Camp Curry: Hello, Glacier Point. Glacier Point: Hello, Camp Curry. Camp Curry: Is the fire ready? Glacier Point: The fire is ready. Camp Curry: Let the fire fall. Glacier Point: The fire falls. By 1960, the middle exchange ("Is the fire ready? "; "The fire is ready.") was eliminated. As the fire fell, the "Indian Love Call" was sung at Camp Curry while visitors saw what seemed to be a waterfall of fire. At the campground sites where Ranger-Naturalists (as they were called then) gave nightly summer talks, "America the Beautiful" was played, and the audience sang along. The time of the Firefall was established as 9:00 p.m. The Ranger-Naturalists had to be careful to end their programs in the campgrounds and at Camp Curry right at 9:00, or the "fire would fall on the program." In 1962, President John F. Kennedy visited Yosemite National Park, and on that night an especially large fire was built on the Point to make a spectacular Firefall. President Kennedy was on the telephone at 9:00, so the Firefall was delayed until he finished, and the Firefall occurred around 9:30 p.m. Sometime, probably by 1920, red fir bark was found to be the best fuel to produce an even flow of coals, so fires were made of red fir bark instead of wood. Employees would gather huge piles of the bark, which they stored near the hotel; each day a stack of the bark would be placed on the Valley side of the Point, to be lit that night and to burn for a couple hours to produce a bed of coals. Through the years, visitors to Glacier Point enjoyed watching the hotel employees gradually push the glowing embers off the cliff with long-handled metal pushers. In 1925 all the rival business companies in the Park united to form the Yosemite Park and Curry Company under the direction of the Curry family. YPCC continued to be the concessionaire of Yosemite National Park until 1993 (Although the YPCC has been owned by various corporations in recent decades, the name remained unchanged). During World War II the Firefall was discontinued. Some people in both the National Park Service and the Yosemite Park and Curry Company hoped that it would not be continued after the war. The NPS considered it an unnatural event in a natural area, and the task of presenting the Firefall each night was burdensome to YPCC. Employees drove trucks farther to find the red fir bark, because they were allowed to collect it only from trees that were dead and down. Before the Firefall ended, they were going as far as the Tioga Road. After World War II, the public demanded the Firefall's return. In January 1968, Park Service ordered the Firefall be discontinued on the grounds such a man-made event was inconsistent with the Service mission to encourage appreciation of natural wonders. Also, the traffic was increasingly problematic, as each night a stream of cars left the campgrounds and meadow areas where people had gone to get the best views. The last Firefall was on Thursday, January 25, 1968. Since it was winter, no crowd was present. The Firefall might have been discontinued by natural means the following year anyway. The winter of 1968-1969 had very heavy snow. The Glacier Point Hotel was damaged by snow pack, and needed to be razed and rebuilt, hence no guests were booked that summer. A few employees lived in the old Mountain House (then the oldest building in the Park), selling snacks to Glacier Point daytime visitors. In early July 1969, an electrical fire began in the lower floor of the unattended Glacier Point Hotel, and the hotel, Mountain House, and many trees burned. The pile of red fir bark near the hotel, left from previous summers, helped fuel the fire. Glacier Point was closed to visitors for the rest of the summer of 1969 while workers cleared the debris. The next summer the Yosemite Park and Curry Company built a small snack shop to serve daytime visitors to Glacier Point. YPCC considered rebuilding a hotel at Glacier Point, but the Park Service would not permit rebuilding at the same location; it would have to be placed further back from the precipice. Water was always a problem at Glacier Point. Some summers the hotel was closed in August due to insufficient water. In 1974, musician Rick Roberts named his band "Firefall" after the Yosemite spectacle. The dénouement of Richard P. Powell's novel Say It With Bullets takes place at the Firefall. Sargent, Shirley. Pioneers in Petticoats: Yosemite's Early Women, 1856-1900. Los Angeles: Trans-Anglo Books, 1966. Sargent, Shirley. Yosemite & Its Innkeepers: The Story of a Great Park and Its Chief Concessionaires. Yosemite: Flying Spur Press, 1975.